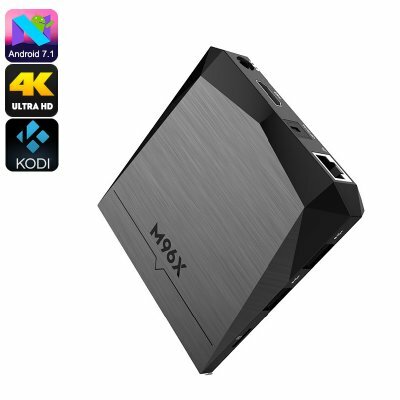 Successfully Added 4K TV Box M96X - Android 7.1, Google Play, WiFi, Miracast, Quad-Core CPU, 1GB RAM, Kodi V17.1, 4K Support to your Shopping Cart. With the M96X TV box, you’ll be able to bring hours worth of mobile fun and entertainment into your living room. Simply attach it to your TV set, and you’ll be able to turn it into a full-blown Android TV. From now on, you’ll be able to browse the web, play games, and watch movies on demand from your big screen TV. This Android TV box offers access to Google Play and Kodi TV. Thanks to this, you have millions of the latest media files at your disposal. Download the latest TV apps, watch movies, and play games. Nothing is impossible with this powerful TV box. By supporting 4K resolution, this 4K TV box brings a cinematic experience straight into your living room. You’ll be able to enjoy deep and vivid colors as well as extreme details. From now on you can enjoy your favorite films and series liken ever before. Additionally, this Android TV box also packs the ARM Mali-450 GPU. This Penta-Core graphic unit supports you in playing the most demanding games and applications. With all its features, this 4K TV box makes sure that you’ll never have to feel bored again. Within its sleek body, the M96X Android TV box packs a Quad-Core processor that has been clocked at 1.5GHz. It furthermore holds 1GB RAM and 8GB of internal storage. With this hardware at your side, you can enjoy media without needing to worry about slowing down your device. Additionally, you’ll also be treated with a 32GB SD card slot. Having the possibility to slide in external memory guarantees you that you’ll never run out of storage for your games and movies. Additional features such as Miracast are there to further increase your overall user experience. This beautiful Android TV box runs on the latest Android 7.1 operating system. Thanks to this, you’ll be treated with a smooth and lag-free user experience. It furthermore allows you to use the latest software features that are currently available. With this Android 7.1 TV box, you certainly are allowed to take the most out of your media experience. With its WiFi support, you’ll be able to download entertainment in the blink of an eye. You can use it to watch films, play movies, or browse the web. With this Android TV box, not a single moment of boredom will ever enter your household again.